Rainwater harvesting is simply the process of collecting and storing rainwater for use as a valuable alternative or supplemental water supply. Rainwater harvesting has been used in countries around the world as a water source for households, livestock, irrigation and agricultural demands for decades. It is considered an energy and water saving environmental enhancement for residential and commercial applications throughout the United States. How can I collect rainwater? 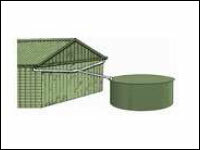 The most common method for collecting rainwater is by diverting rainwater collected from a roof catchment area (such as a house or garage) via a guttering and down pipe system into a water storage unit, such as a water tank. How much water can I collect? Water consumption can vary widely due to different factors such as water usage for washing or bathing. This calculator will help you gauge how much water you can collect off your roof. Annual rainfall (in inches) x 0.623 for collectable gallons x Roof area available for rainwater collection (in ft2) = Gallons collected annually. Please note that this is a rough guide only and is not an indication of how much water you will use. 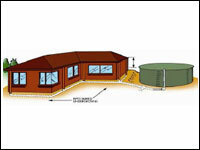 Where can I get more information on Rainwater Harvesting? For more information on rainwater collection, contact Rainwater Collection or phone toll free on 1-800-464-2951 to speak to one of our consultants today.